For the period of April 2018 to October 2018, the GOJ reported Total Revenues & Grants of $338.28 billion, $5.41 billion more than the Government’s projection. Year over year, this represents an increase of approximately 13.7% relative to the $297.59 billion recorded for the corresponding period in 2017. ‘Tax Revenue’, ‘Capital Revenue’ as well as ‘Grants’ outperformed projections during the review period, while ‘Non-Tax Revenue underperformed projections during the review period. ‘Tax Revenue’ amounted to $300.19 billion, $8.17 billion more than budgeted, ‘Capital Revenue’ totalled $2.51 billion, $1.94 billion or 339.9% more than budgeted while ‘Grants’ overperformed the budget by $490 million, amounting to $6.54 billion during the review period. ‘Non-Tax Revenue’ of $29.05 billion was reported; $5.19 less than budgeted. Notably, no provisional amounted was booked for ‘Bauxite Levy’ for the review period. Total Expenditure for the period April 2018 to October 2018 amounted to $337.01 billion, $6.20 billion or 1.8% less than the budgeted $343.20 billion. Recurrent expenditure which totalled $301.57 billion, accounted for 89.49% of overall expenditures. Relative to projections, recurrent expenditure was $6.28 billion (2%) less than budgeted. 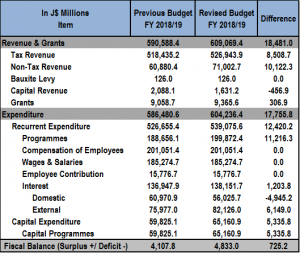 ‘Programmes’ which amounted to $110.34 billion was $3.32 billion or 2.9% less than projected, while ‘Employee Contribution’ which amounted to $9.02 billion for the period was under budget by 5.7% relative to the budgeted $9.57 billion. ‘Compensation of Employees’ amounted to $113.72 billion, $1.09 or 0.9% less than projected. While, ‘Wages & Salaries’ amounted to $104.70 billion and was $540.4 million or 0.5% less than projected. As a result of the increase in Expenditures for the period April 2018- October 2018, the ‘Fiscal Surplus’ was $1.28 billion, relative to a projected deficit of $10.33 billion. 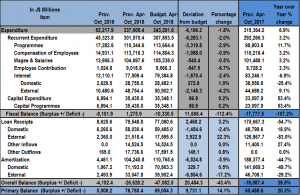 Additionally, the primary balance for the period amounted to $78.79 billion, 14.1% more than budgeted. As part of the Memorandum of Economic and Financial Policies (MEFP), the GOJ estimates that the primary balance, as a performance criterion, should amount to $141.1 billion by the end of the 2018/2019 fiscal year. For the September quarter, a primary balance of $44.0 billion was estimated. As at the end of October 2018, this amounted to $78.79 billion. Tax Revenue was expected to total an estimated $234.0 billion by the end of the September quarter. The reported tax revenue for the end of October 2018 was $300.19 billion. YTD, the government for the most part has outperformed its targeted revenue while keeping most expenditure line items below budget with the exception of Capital expenditures. Capital expenditure during the first quarter of the fiscal year (Apr-Jun 2018), was “higher than budget for the period by approximately 5%.” This according to the government is the first in nearly a decade. Non-Debt Expenditure is expected to rise by $16.6 billion due to the ‘Street Lighting Arrears and Current Payments’ due to Jamaica Public Service (JPS) by the Local Government. This increasing arrears for street lighting have translated into significant and growing areas due to Petrojam by the JPS. Additionally, the non-payment to Petrojam is impacting the Company’s capability to pay its tax obligations and other expenses which forces the Company to obtain additional financing to facilitate its operations. With regards to the Major Infrastructure Development Programme (MIDP), adjustment in the provision to align expenditure with the increased pace of execution; that is the major improvements that are being undertaken in the Kingston Metropolitan Area that needs to be completed within the shortest possible time, led to $7.34 billion being accommodated in the Supplementary Estimates. Below the Line Provision of $35.2 billion to address Bank of Jamaica recapitalization, the purchase of Petrojam shares and the loan to Port Authority of Jamaica in respect of the Business Process Outsourcing facilities. The remaining $8.5 billion is expected to be financed from higher revenue flows.